On a standard tandem frame, is it possible to build a tandem bicycle with independent drivetrains for the two riders? Is there a custom frame builder that would build a tandem like this? 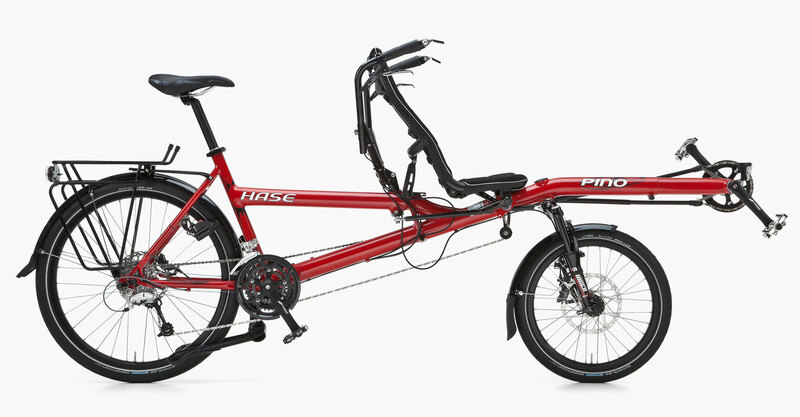 I'm aware of the half-recumbent tandem that has independent drivetrains, but I'm specifically interested in the classic/normal tandem frame. EDIT: By independent drivetrain, I mean that I would like each rider to be able to coast independently of the other. The cadence can remain constant between front and back when both are pedaling. Here is a link to a video of people riding a recumbent tandem. https://binged.it/2TXkxJC The video does a good job of explaining that the front crank has a freewheel mechanism that lets the riders pedal at different speeds. The front rider can also stop pedaling. If this is what is meant as "independent drivetrains" then the functionality is in the crank rather than the frame itself. The key to having a regular tandem like the recumbent tandem in the video is to find someone who makes a crank with a freewheeling chain ring. Like the old school Schwinn Suburban's from the late 70s with Shimano Positron FFS (Front Freewheel System). With this part - or something like it - any tandem frame builder should be able to get you going. As Chris H points out in his comment, this could mean two different things. The half-recumbent/half-upright design does have separate gearing for each rider. There's a different system that some conventional recumbents use that gives each rider the ability to coast independently, but they pedal at the same cadence: both sets of cranks drive a jackshaft (located just in front of the stoker's crank), which in turn drives the rear wheel. There have been numerous ideas for bike drivetrains over the past century, and it's easy to imagine that other ideas have been tried out and lost to history. I know of two solutions to your question - I'll post two brands, however they are not meant as an advertisement, rather as a starting point for further search. One is used by Onderwater Fiets from Amsterdam. Their tandems (and also more persons bikes) combine the stoker and pilot function and are meant for families. There, the drive is permanent between the last bottom bracket and the rear wheel and other bottom brackets are somehow free-wheeled so the passengers in front can pedal individually. The other is R&B Fly, not much can be found about those on the Internet. Funny thing, I own one, hence the independent drive can be further inspected. There, each chainring (single for the pilot; double, same size for the stoker) attached to the crankset is freewheeled, thus pedalling can be done independent. Anyway, this bike awaits some renovation, I haven't ridden it yet. Thus, it is possible to build a tandem with independent drivetrains and with enough invention you can even build one where the cadence don't need to match (add a front derailleur and triple chainring to the pilot's seat for higher / same / lower cadence as the stoker). Not the answer you're looking for? Browse other questions tagged drivetrain tandems or ask your own question. Why is the rear wheel of my tandem bike skidding? Claud Butler Tandem - add a front derailleur? Why is a tandem harder to ride uphill than a single rider bike? Help Identify North Woods “6 Speed” Tandem?